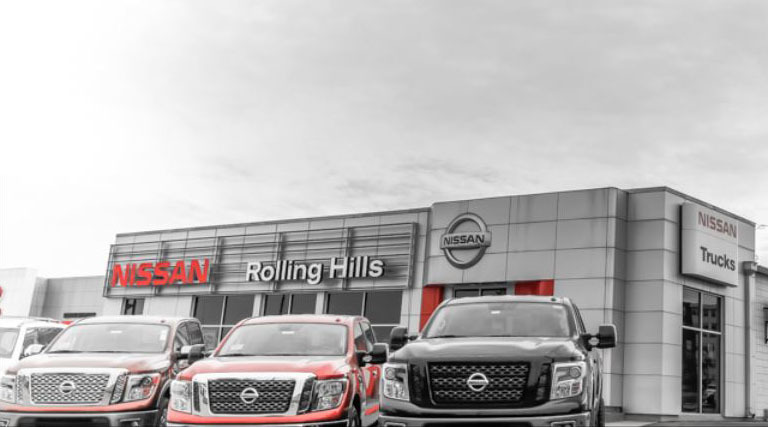 Rolling Hills Nissan in St. Joseph, MO offers new and used Nissan Altima, Armada, Frontier, Kicks, Leaf, Maxima, Murano, Rogue, Sentra, Pathfinder, Titan, Versa and Versa Note. Rolling Hills Nissan serves St. Joseph MO and the surrounding area! Rolling Hills Auto Plaza Nissan! Rolling Hills Auto Plaza serving St. Joseph Mo. New and Used car dealer offering new Honda, Nissan and Toyota! Rolling Hills Toyota is you new car dealer in St. Joseph MO offering New and used Toyota cars, trucks and SUV's! Rolling Hills Nissan in Saint Joseph, MO treats the needs of each individual customer with paramount concern. We know that you have high expectations, and as a car dealer we enjoy the challenge of meeting and exceeding those standards each and every time. Allow us to demonstrate our commitment to excellence! Our experienced sales staff is eager to share its knowledge and enthusiasm with you. We encourage you to browse our online inventory, schedule a test drive and investigate financing options. You can also request more information about a vehicle or by calling 888-753-4631. If you don't see a particular vehicle, click on CarFinder and complete the form. We will gladly inform you when a matching car arrives. If you'd like to see a vehicle in person, click here for driving instructions to our site, or give us a call. We look forward to serving you! Doug Mueller helped me find just the right “cute” car that would fit all my needs and my new commute to work! My last three cars were purchased here. Doug Mueller was very helpful and kind. He explained everything I was signing and helped me understand how my new car worked. We just purchased a new to us vehicle with the help of Bruce Mouncey and the crew at Rolling Hills Auto. We went with the intentions of "just looking" at the Nissan Rogues on the lot and came home later that day with our 2017! I can't say anything but the very best! To Bruce, service and finance crew.....you made our experience one of a kind!! Go see Kelvin and his whole group they are great! They relay make you comfortable and I never felt pressured. They also beat all the other dealers prices. It was fast easy and friendly! My first experiences with Rolling Hills were with Josh in Honda service. He is awesome...so friendly and helpful! Because of these positive interactions, my husband and I decided to shop there for our new vehicle. Glad we did! Our salesman, Matt Banks, was wonderful...very kind, patient, and friendly! He has even gone above and beyond after the purchase of our vehicle. Thanks to these two guys, Rolling Hills has earned our business! Great Experience! Love our “new to us” Honda Pilot. Kelvin was great to work with! Excellent selection of cars, friendly and laid back atmosphere, and an exceptional team of people make the car buying experience enjoyable and easy! HIGHLY recommend Rolling Hills! Let me start off by saying that I am in my late 40's, female and newly divorced, and I have always purchase vehicles with cash...never at a dealership, because the one time I went I felt like I was being picked over like road kill and they where the buzzards... I was moving 1100 miles, towing a 12' enclosed trailer and the timing belt broke on my Honda Pilot half way to my destination. When the shop that it (and the trailer, too) was towed to could not even communicate with it by scanner, they suggested I take it to a dealership. OH NO! I made an appointment, scheduled another tow of ALL of the wheels I had on the ground an hauled it to Rollin Hills Auto Plaza. Well, I think someone was looking out for me, because it wasn't the dealership that I had made the appointment with AND I AM SO VERY GRATEFUL!!! Mario Gutierrez, my sales person (after I got the bad news!) was so awesome! In fact, everyone in that place puts you at ease, no pressure. Just 110% Wholesome, old fashioned REAL customer service that you don't expect from any where anymore. Especially a car dealership. Mario was so patient, so helpful, and answered all of my questions (even what I thought where the stupid ones) with the knowledge that made me feel safe to continue with the deal! SUPER MARIO!!! He stayed by me through out the entire ordeal. No joke! He even went with me to the place to look at the hitch...(even though they couldn't help me...and that's another story!). Thank you Rolling Hills for bringing back true CUSTOMER SERVICE. I would also truly like to thank Sloan, Jeremy and Danny for going above and beyond. Please keep doing what you do! It is appreciated! Erin now safe in Wisconsin! Mario was absolutely wonderful! First time buying a car myself, and he helped me every step of the way. Answered every question I had and if he didn’t know he got someone who did. Very professional, yet relaxed and easy experience. Loving my ‘18 Corolla. Thanks Mario! My husband and I recently purchased a new Tacoma here with the help of Kelvin and we drove away with the exact truck we wanted within the morning! It was a very informative, efficient, and positive experience. This is the 3rd new Toyota my husband and I have purchased together, the 1st time at this dealership, and this was the best experience yet. Talked to Mario and he helped my oldest to buy his first car. Had a great time and during the purchasing and driving other cars he let me test drive the 12 charger stack pac. Had a great time. This is our 2nd purchase from rolling hills. We will definitely be back for our next purchase. Thanx rolling hills and Mario!